Yes, it’s quite true. I have had on any given Sunday a child lap the sanctuary, inquire quite loudly if “we’re done yet?”, crawl under several rows of pews before being caught, rip a page out of the hymnal, spill their snack all over the floor and proceed to stomp it into a billion pieces, scream bloody murder, and line the pew behind me with a train track of feminine products they found in my purse while an elderly man watched in horror and I, fully unaware and singing, had no idea such a display lay behind me. Shall I go on? You get the picture. And yes, I’ve driven home many a day in tears. This is the life of a parent trying to attend church with a young child. It is no small feat. It comes with many embarrassing moments, days of frustration and exhaustion, words of judgment, and ugly looks of ridicule. You may wonder why one should keep trying, why you should keep trying? It really wasn’t until I became Lutheran that I began to understand. 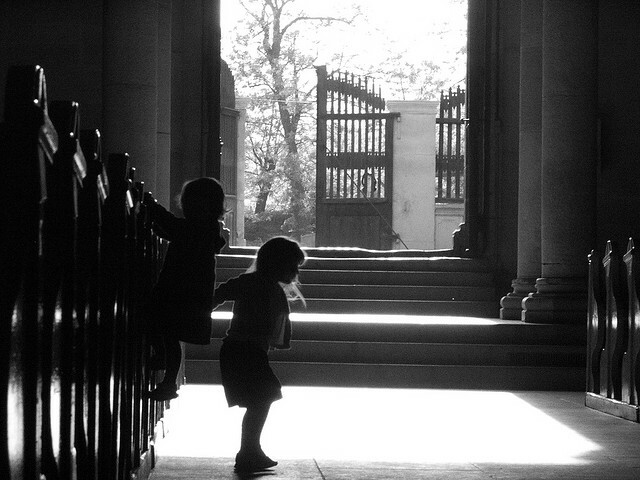 In the churches I grew up in (Southern Baptist and Calvary Chapel) there was always childcare during the service. Some would simply not allow children under age nine to enter the sanctuary. I was even physically ushered to the back of the sanctuary, not allowed to sit with my family, because I was there with my two-month-old daughter. These churches hold to an un-Biblical teaching that claims there is an age of accountability. If a child is younger than about third grade, they get a free pass to heaven. In these churches, children become a distraction for the work of the Holy Spirit. Someone might not get saved if your child is making noise. It is as if the Holy Spirit is scared away by the smell of Cheerios or the sight of a crayon! Sarcasm aside, when I began to understand what worship is and the “why” of going to church, taking my kids, with all its difficulty, became very clear. Worship is to receive the gifts of God. It took a while to sink into my own head. Worship is receiving the Lord’s gifts. Gifts like the forgiveness of sins. Gifts like the hearing of His Word. Gifts like salvation. See Ephesians 1:7, Romans 10:17, Romans 1:16. There is no age limit for receiving the gifts of our gracious and forgiving Lord. When this becomes clear, taking your children to church becomes part of what a good and loving parent does. Our precious little ones need to receive these gifts, too, and they should not be denied. It is worthwhile to do a bit of studying on the Greek word for “children” used in this text, as it means infants, not big kids. This scriptural look at the faith of children may help. When I realized it was part of my vocation as mother to take my children to church, I decided to fight this great battle. Fighting not against my children, but against the devil who takes great delight in keeping me and my children from going to Church. This raging beast is waiting to devour our faith. Our Lord has provided the Church with His Gospel. The Gospel that gives us faith, and sustains us in it. From the time a child is six months old to around four years old your Sunday mornings will be a challenge. Still, you will begin to reap the rewards! Pretty soon, you’ll think “Hey, I made it through the sermon before I had to sneak out.” Or you’ll notice your two-year-old whispering the last word of every phrase of the Lord’s Prayer. Or you’ll see a drawing that strangely resembles the sermon. Or in the car ride home your child will ask one of those dumbfounding questions that you need your pastor to answer. These, dear friends, will bring your heart great joy! Thanks for this. My husband recently started a job that requires him to work every other Sunday, and we just had a new baby. Last Sunday I took my twi children to church alone for the first time. My 2 year old son was so excited to meet the new pastor that he ran up the center aisle during the benediction. Newborn in tow, I dragged him back to the pew. This is a good encouragement for those of us with small children. They do learn even if we don’t think they do. My 4 year old just started wanting to say the Lord’s Prayer at night and he knows most of the words! So it’s definitely worth dealing with the difficulties. I have seen many things from the “other” side of the rail/pulpit. When the pastor makes the sign of the cross to dismiss the table of communicants and the 12 month old (being held in the arms of the parent) tries to mimic the same, you know you are on the right track. All the more reason to encourage our pastors to teach and model the Biblical fact that we are the “family” of God! The Divine Service – a.k.a. “worship” or “church on Sunday morning” – is not performance time or lecture time or whatever time. It’s time for the *family* of God to gather and hear God’s Word and receive His gifts. And that includes the littlest, and the noisiest, and the most active, children, whether they are 2 or 20, 4 or 40, 8 or 80. Thanks, Keri, for broaching this subject. 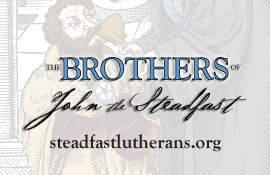 Also see http://steadfastlutherans.org/2013/12/children-in-church/ . I am cut to the heart. Please forgive me. I have been the perpetrator of nasty looks. Complete sympathy for parents with very young ones and I’m sure everyone empathize. However toddlers can behave if they are given strict clear parameters. My Dad often told us (my brother, sister and I) how we each acted up in Church…once…only once. We were taken out of the sanctuary, spanked, returned to our seats with the family and we behaved. Mom would have ‘Wild Cherry and Butterrum’ lifesaver, and we were permitted to nap in the pew. This was the norm in America life then, it should be that again. Well written, Keri! As we grew up in Baptist churches, having our children in church with us was quite the adjustment, but the fruits of children being in church from day one are very apparent, as you aptly pointed out. Thanks for writing this! I had a dream last night, surely brought on by this post— my sons were little again, and running around our Lutheran Church’s Foyer, and EVERYONE was marveling at how adorable they were! They actually grew up under the disapproving furry eyebrows of a Baptist Church, and all of us still bear the remembrance of their inability to ‘behave’ and ‘grow like Jesus’. Our sons are now teens and our conversion as Lutherans came with the welcomed teaching that children are indeed how the church is enlarged, and baptism— not behavior, is our saving grace! I no longer have small children, but I still applaud this.